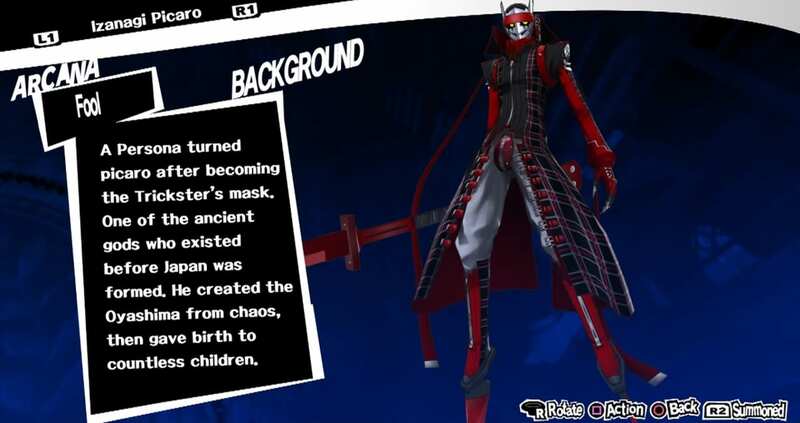 Skills and stats for Izanagi Picaro in Persona 5. A variant of Izanagi, a special character who previously appeared as the protagonist's Persona in Persona 4. This persona is available from pre-ordering the digital version or as DLC. His name is mentioned in several chronicles as Izanagi-no-mikoto which translates to “male-who-invites.” Together with the primordial Shinto mother goddess Izanami, he molded the islands and deities of Japan. With the advent of Izanami’s death, Izanagi attempted to take her back from the underworld in what ended being an unfortunate, futile attempt. Izanagi can only glance at her in her grotesque for. Despite her efforts to kill “a thousand of Izanagi’s men each day,” he replies with attempts to outnumber hers by having 1,500 born in return. Izanagi Picaro is a variant of Izanagi with slightly higher stats and a few different skills. Click here to go to our Persona Compendium. Rising Slash 14% HP Deal heavy Physical damage to 1 foe.